Now you can charge up all your USB-powered devices by simply breathing. 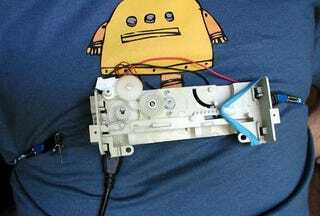 Here's a guy who figured out a way to make his own charging device out of a few spare parts from a CD-ROM drive and some rubber bands. Strapping this odd-looking thingamajig around his chest, it derives its power from the expansion of his chest when he breathes. This might be a great idea for high-altitude hikers, who must breathe a lot more than usual while ascending steep slopes into thinner air. From the looks of it, this contraption is not easy to make, but check out Instructables for the full step-by-step instructions. Goes to show, you never know where you might be able to tap into some energy that's already there, literally right under your nose.